In this article we will consider the most popular of them, i.e. many-to-one mapping of сomponent navigation properties. We will not focus on one-to-many and one-to-one types of сomponent navigation properties mapping, as these types of mapping are not very common, besides, their usage and customization have little difference from the example under consideration and so are quite comprehensible. 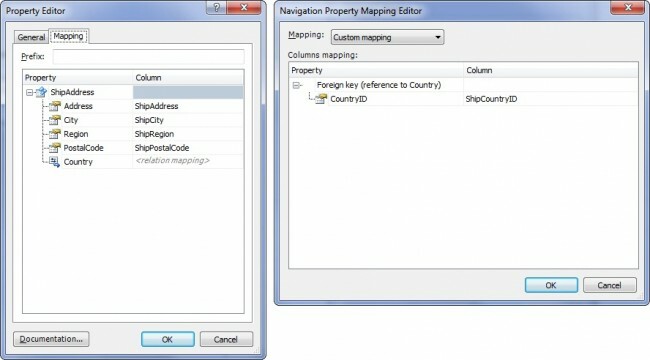 Many-to-many mapping is considered in details in the article Support of Many-to-Many Mapping for Component Navigation Properties in Entity Developer. 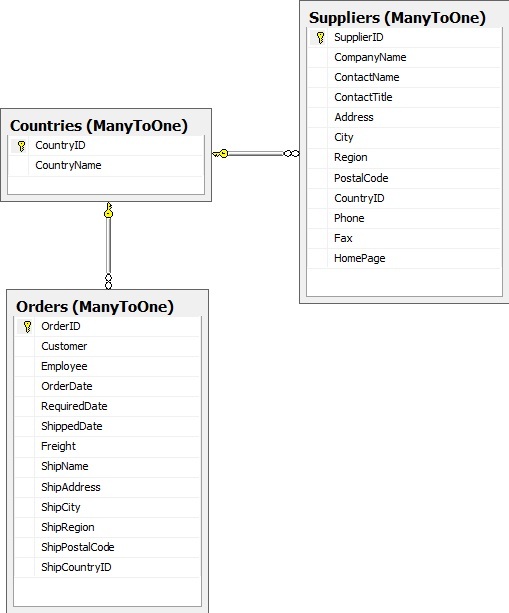 This type of mapping can be efficient in case there are several tables in the database referring to the same details table using a foreign key constraint, and also, possibly (but this is not a must), having some set of fields matching in meaning and structure. Or the same table contains several sets of fields or foreign keys similar in structure, describing respectively several data objects similar in structure (e.g. when the same table containing descriptions of companies includes several matching sets of fields representing addresses of head and shipping offices). 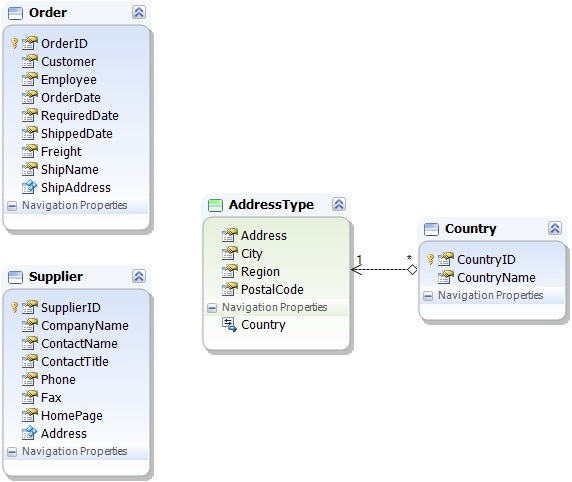 Then, after creating a model, it makes sense to move the similar set of the corresponding scalar and navigation properties into a separate complex type, and replace every such set in entities with a property having type equal to complex type and an appropriate customization of private mapping for this property. The database contains the Orders and Suppliers tables, which have a foreign key constraint with the Countries table. The Orders and Suppliers tables have the same fields containing address description, and also a foreign key column associated with the table containing country names with a foreign constraint. 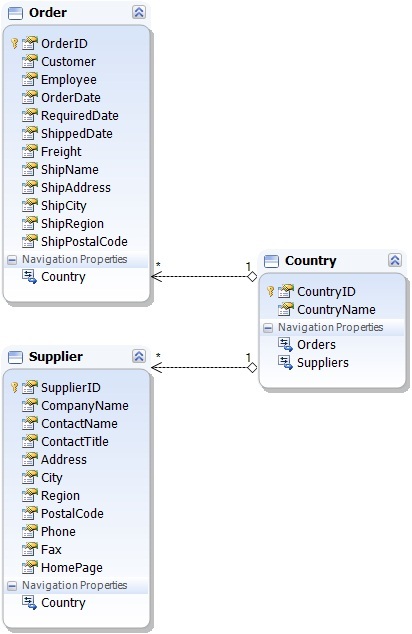 add the Orders, Suppliers and Countries tables to the model. 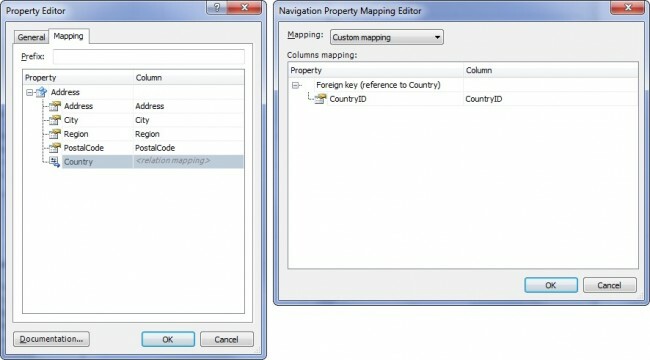 We select the Address, City, Region, PostalCode properties and the Country navigation property of the Supplier entity which are used to describe address, drag and drop them into a separate complex type and call it ‘AddressType’; an association appears between this complex type and the Country class and from now on it is the AddressType complex type that contains the Country navigation property, and instead of the set of the moved fields the Supplier entity contains a property with the type equal to AddressType, let’s call it Address. 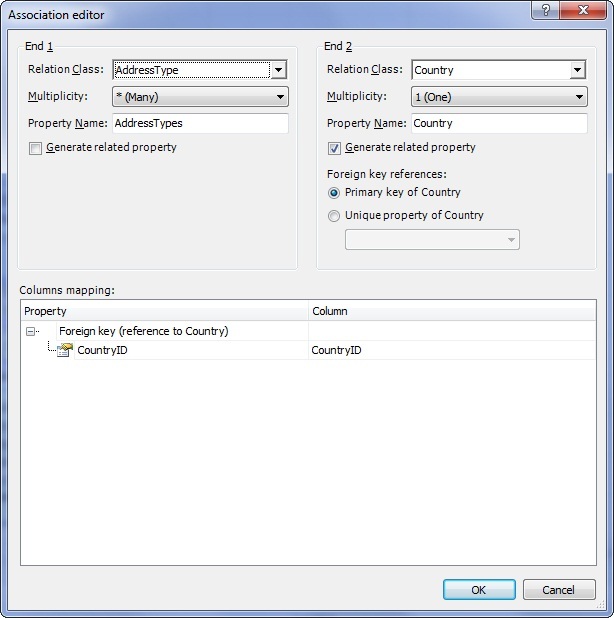 As can be seen from the Association editor dialog box, part of relation settings is in the association itself, for the many-to-one case there is also a default mapping for the foreign key column of an entity which will contain the property of the specified complex type, but if necessary, it can be changed to a custom one for a certain entity property. This will be shown in our example further in this article. /// There are no comments for AddressType in the schema. /// There are no comments for PostalCode in the schema. /// There are no comments for CountryID in the schema. /// There are no comments for CountryName in the schema. /// There are no comments for Supplier in the schema. /// There are no comments for SupplierID in the schema. /// There are no comments for ContactName in the schema. /// There are no comments for ContactTitle in the schema. /// There are no comments for Phone in the schema. /// There are no comments for Fax in the schema. /// There are no comments for HomePage in the schema. /// There are no comments for Order in the schema. /// There are no comments for OrderID in the schema. /// There are no comments for Customer in the schema. /// There are no comments for Employee in the schema. /// There are no comments for OrderDate in the schema. /// There are no comments for RequiredDate in the schema. /// There are no comments for ShippedDate in the schema. /// There are no comments for Freight in the schema. /// There are no comments for ShipName in the schema. /// There are no comments for ShipAddress in the schema. As can be seen from the generated code, a property is generated in the AddressType class, containing a reference to the Country class, and the classes Order and Supplier in their turn both contain a property with type equal to AddressType, and these properties describe addresses of the shipping company and vendor respectively.